The following information is an overview of potential stewardship measures for overwater structure leases on state-owned aquatic lands. These stewardship measures represent what DNR believes to be the best way to achieve our goals of preventing and minimizing impacts to aquatic habitat and species. DNR is also open to alternative methods that lessees may propose to meet our goals as well. The appropriate application of stewardship measures is always determined on a case-by-case and site-by-site basis, and not every measure listed below may necessarily apply to every site. For existing improvements, DNR works with the lessee on the timing for incorporating agreed-upon measures, such as during an ordinary maintenance or repair schedule, or during future expansion activities. The following is for informational purposes only. Avoid skirting on any overwater structure. 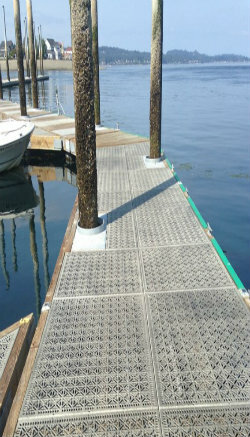 Install grating on new and modify existing floats, piers, wharves, fingers, docks, fixed docks, and/or gangways to maximize the amount of sunlight that can pass through. For floats, fingers and docks, seek to install unobstructed grating on at least fifty (50) percent of the surface area; grating material must have at least sixty (60) percent functional open space or 40 percent or greater multi-directional open space. For gangways, piers, wharves and fixed docks, seek to install grating on one hundred (100) percent of the surface area; grating material must have at least sixty (60) percent functional open space or forty (40) percent or greater multi-directional open space. Site new or expanded improvements to avoid impacts to native aquatic vegetation. Construct all new improvements or expansions to existing improvements to avoid destruction or disturbance of aquatic vegetation used for spawning. Orient structures in a north-south direction. Place structures in deeper water where they will not shade nearshore aquatic vegetation. Orient any canopies or boat lifts in a north-south direction. ​Renovate boat houses to maximize light penetration on roofing using materials that meet current local fire and building codes. 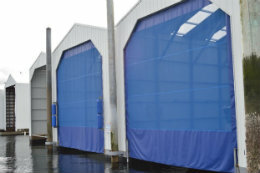 Install boathouse doors that are transparent or include translucent curtains or door panels to maximize light penetration. Remodel internal boathouse walkways with grating material when structurally feasible. All operations above, on or near the water risk - usually unintentionally - contaminating water, degrading ecosystems and causing chronic health problems. Design facilities so water can freely flow to prevent the buildup of waste and sediment. Do not work without a National Pollution Discharge Elimination System (NPDES) permit. Use tarps to prevent dust, drips and spills from entering the water. Provide sewage disposal facilities at marinas. Prevent contaminated runoff from entering the water. Implement practices that prevent bark from rubbing off logs when they are in the water. Maximize water exchange by locating facility openings to promote flushing and prevent trapping surface debris and oily residue. Underwater hull scraping and other underwater removal of paints. Above waterline boat repairs or refinishing in-water except if limited to decks and superstructures and less than 25 percent of a boat is repaired or refinished in-water per year. Use tarps and other dust, drip and spill containment measures when repairing or refinishing boats in water. Do not store fuel tanks, petroleum products, hydraulic fluid, machinery coolants, lubricants and chemicals in locations where they can leak into the water surface. Inspect all equipment using petroleum products, hydraulic fluids, machinery coolants, chemicals, or other toxic or deleterious materials on a monthly basis and immediately make all repairs necessary to stop leakage. 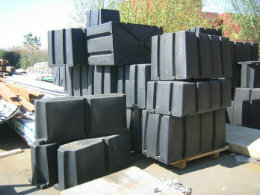 Maintain a supply of oil spill containment materials adequate to contain a spill from the largest vessel in use. Avoid the use of treated wood on decks, pilings, or any other structure above or below water, except ACZA treated wood for above water structural framing. Avoid use of tires at any location above or below water. Use only floatation material encapsulated in a shell resistant to ultraviolet radiation and abrasion and capable of preventing breakup and loss of flotation material into the water. Follow provisions of Chapter 90.56 RCW Oil and Hazardous Substance Spill Prevention and Response Act. Wash gravel or shell for aquaculture beds on uplands. Maintain a sewage management plan by that identifies and explains the methods for disposing wastewater from vessel holding tanks and portable toilets and identifies available upland restroom facilities in accordance with the National Management Measures Guideline to Control Nonpoint Source Pollution from Marina and Recreational Boating, EPA 841-B-01-005 - http://water.epa.gov/polwaste/nps/marinas/mmsp_index.cfm. 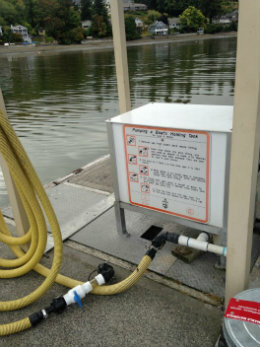 Develop a sewage management plan for docks and marinas with moorage for more than 10 boats that includes options for disposing wastewater from vessel holding tanks and portable toilets and identifies availability of upland restroom facilities. Floating structures can crush vegetation and animals and compact sediment in low water. Compacted sediment may not be able to support habitat. Avoid grounding, scour, or damage to aquatic land and vegetation. 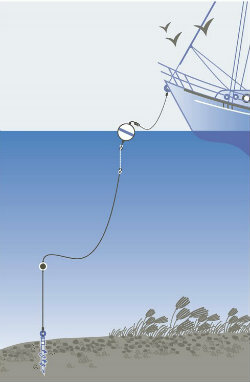 Avoid mooring or anchoring vessels in shallow water so boats will not run aground and propellers don’t disturb the sea floor in extreme low tide. Locate new floating structures in water depths that avoids grounding out or install stoppers sufficient to prevent grounding, keeping the bottom of the structure above the level of the substrate. Use embedded anchors and midline floats. Established beach access routes to shellfish aquaculture leaseholds for vehicles, equipment or personnel on foot to minimize impacts to sensitive aquatic resources, such as forage fish spawning areas and aquatic vegetation. Establish water access to shellfish aquaculture leaseholds, to the extent practicable, to minimize impacts to sensitive aquatic resources, such as forage fish spawning areas and aquatic vegetation. a. Minimize the grounding of work boats and barges in native aquatic vegetation. b. Prevent anchors, chains, and ropes from dragging on the bottom in native aquatic vegetation. Conduct surveys to identify for marine forage fish species spawning areas using WDFW protocols. If surveyed species are found or predicted to spawn develop a plan to minimize impacts resulting from the use. Construct all new or expansions to existing facilities in a location to avoid impacts that might result in changes in typical spawning behavior. Locate new facilities in deeper water. Establish access routes to facilities that excludes or limit traffic in shallow water and intertidal areas.